Boston’s Brookline is quickly rising in the ranks for the best foodie neighborhood in bean town. Regal Beagle is a prime example of amazing cuisine in the area. We came here for a Saturday brunch and got some interesting twists on the classics! 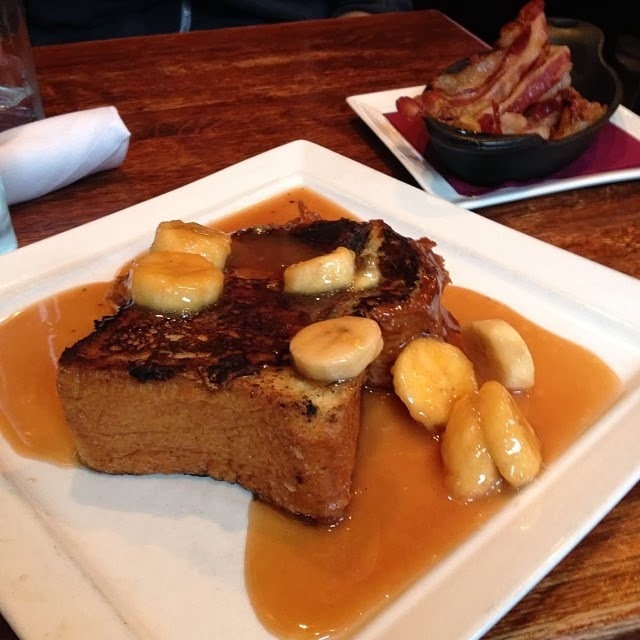 I ordered my all-time favorite brunch dish: French Toast. In place of the customary syrup and berries, my plate came topped with Bananas Foster. It was a delicious take on the usual – still sweet but in a different way. The brioche bread was thick and soft, perfect for absorbing the scrumptious Bananas Foster. Fun fact: Did you know protein is really important to eat in the morning? Your brain actually uses it to create serotonin, which makes you happy! Regal Beagle’s bacon was crisp without being burnt, and was great when dipped in the Bananas Foster! Nick ordered the Curry Chicken Sandwich, a twist on the ordinary chicken sando. It was really good, and tasted like a tuna salad with curry and amazing spices. The leafy green salad was a refreshing and healthy side as well. Regal Beagle is a bar as well as a restaurant. With hardwood tabletops and cloth napkins, it’s great for a night cap or a daytime brunch. The service is good but not spectacular. The food came out promptly but there was little interaction with the waiters – no interesting tidbits on the food or menu, and a quick come-and-go vibe. to be fair, this may be related to the table orientation in the restaurant. The booth tables where we sat were so close together that the waiters couldn’t really squeeze between to take our order and chat us up. Instead, they had to semi-awkwardly lean in from behind the tables. Still, the food and decor were nice enough and I wouldn’t hesitate to recommend a visit here. Comment Challenge: What are you favorite brunch items? Next Post Dessert Pizza: Max Brenner’s Chocolate Restaurant!